Click to viewThe next time you're feeling all smug and twenty-first century commuting into the office while using your laptop to catch up on emails or prep for a presentation, consider the following. 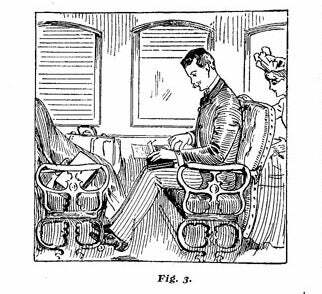 Back in 1893, a publication called The Manufacturer and Builder hyped a new portable typewriter that could "readily be used on the lap, on the desk, on the train—in short, anywhere"—and showed a forward-thinking commuter doing just that. Click through for a closer look at the world's first laptop.
. . . readily mastered, so that after a month or two of practice any one of ordinary intelligence, by application, can acquire a speed of forty words per minute, or about twice the number that a rapid penman will write with the pen. Of course, a fast typist on a QWERTY keyboard could reach speeds of 100 words per minute or more—a fact that may have helped contribute to the World typewriter's fade into oblivion.